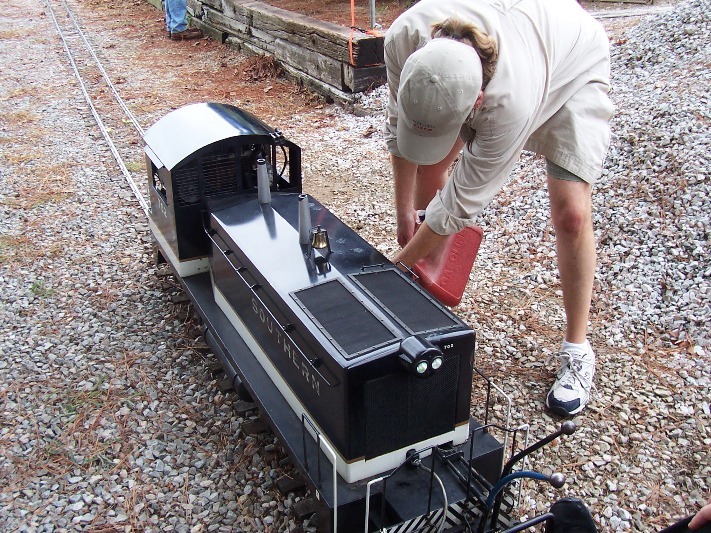 This was our second year attending the North Carolina Live Steam Meet in Apex, NC. The event is held twice a year and is open for invitation only. We had the pleasure of having Ben join us this time around and he had a blast too! The property is located on 55 acres in Apex and just off of Kelly Road and is owned by Tony Sears and his wife Judy. 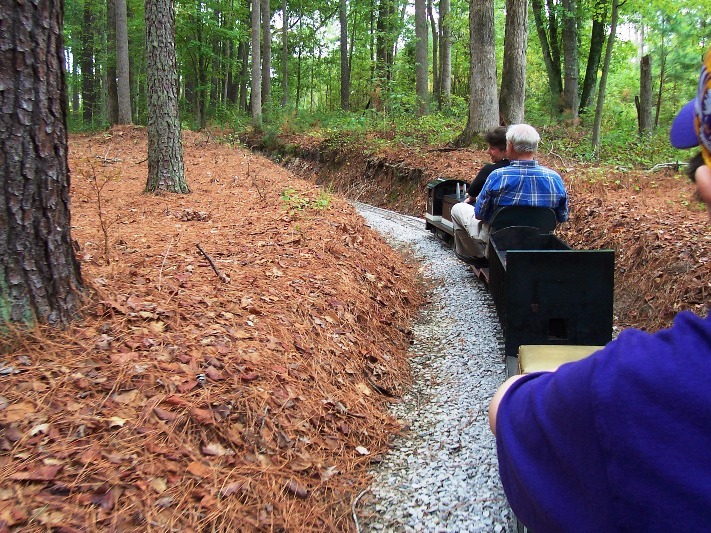 The 7.5" track runs 2.5 miles through wooded and hilly terrain throughout the site, and includes many passing sidings, bridges and a staging yard area with a turntable, roundhouse, and a staging area for loading and unloading the locomotives. We arrived around noon on Saturday and first saw Judy riding around on the golf cart with her cute little dog "Fluffy" a 10 week old Yorkie. She said that Duke had given her the heads up about the Cajun food that we bringing. She and I then rode to the barn and picked up a folding table for the culinary delights. Once the table was set up Duke finally made his appearance and after a few short introductions he and the family grabbed all the food and disposables from the Sienna van. The Cajun Chicken and Sausage Jambalaya was a hit! Just about everyone ate some, and even came back for 2nd and 3rd helpings. While we were eating and talking we meet Tom Watkins who is from Virginia and he builds 1.5 gauge diesel locomotives fora living now. Apparently he has a back log of orders for these custom build locos and has just hired on a helper for production. We also meet Joe Holbrook and his son, Joe built the Southern switcher locomotive 15 years ago and it runs on gasoline. This is the train that we were invited to ride on. 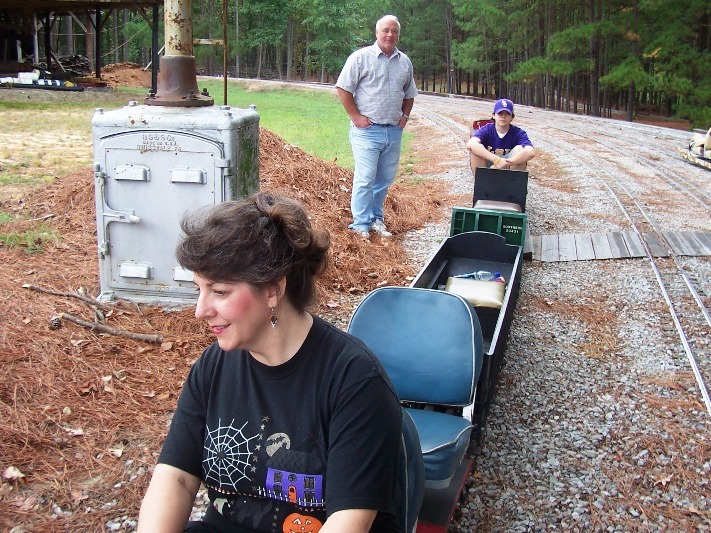 The first ride Joe was at the controls, he backed out the consist from the yard track and moved it into one of the classification tracks, and then after a few short toots on the whistle we were off along the long track loop. At the next stop I was given the opportunity to ride at the controls, Joe gave me a short tutorial on how to manage the forward & reverse lever as well as the power throttle. He also showed me the button to increase the governor and the whistle button too! That's Joe's son refueling the loco (photo above right), seems that a few rounds on the loop require a pit stop! This was just before Monique got to ride at the controls, Joe pointed at her direction and she was quite surprised to get the opportunity to drive the train! She did a great job too! Then Ben was given the same opportunity and he had a real blast driving the consist. In all we got to ride around the facility on 5 separate trips around the facility. By this time most of the Jambalaya was gone so we walked to the storage shed where Duke kept his Honda Goldwing motorcycle and he showed me the revised plans for his HO layout. He has some great ideas for adding another section to include the roundhouse and turntable with a loop as well. Then we walked back to the staging area and talked a bit more, then it was time to go. It was great to meet up with Duke again and meet some new people. I want to thank Duke, Judy, Tony, and Joe for their great hospitality and allowing us to attend again. Hope too see them again next year!